Are you looking for the best vegetable noodle makers? This guide is dedicated to helping you find the right one for your needs so you can make vegetable pasta all day long! Real quick, in case you didn't know -- Vegetable noodle makers or spiralizers mean basically the same thing. 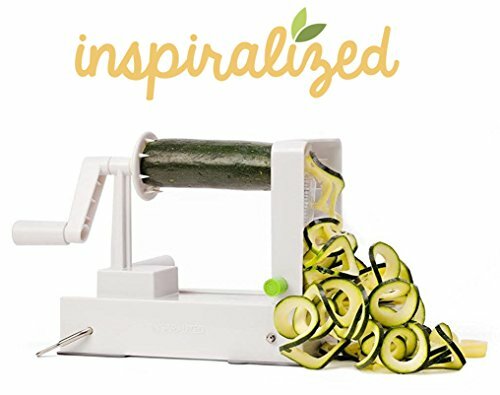 They're tools for turning your favorite fruits and vegetables (zucchini, squash, cucumbers, carrots, etc) into “zoodles” - long, thin spiral slices of pure produce goodness that eat like noodles made out of vegetables! This is a really solid hand-crank spiralizer that can get through almost any fruit or vegetable you can imagine. You can even switch your noodle size with the twist of a knob rather than switching out the blades. If you already own a Kitchenaid or are thinking about getting one this is an excellent choice. Not only will it save you space, but this thing was built to make quick work of a wide variety of produce. 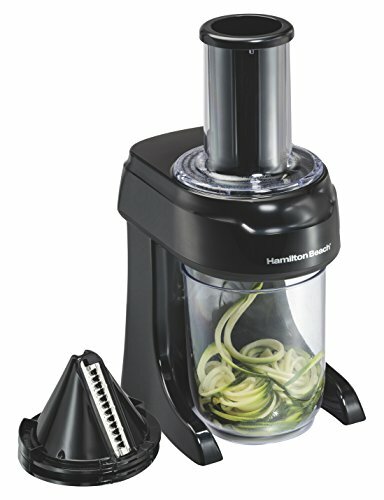 If you're set on an electric spiralizer, but can't do the Kitchenaid, this is also a great pick. Ideal for the basic veggies like zucchini, it's great for someone who doesn't want to do any manual work to make vegetable noodles. While handheld spiralizers aren't necessarily ideal for large batches. if you need to save on space and are primarily cooking for one person, we suggest the Oxo Hand Held. Vegetable noodles are just what they sound like: noodles made out of vegetables! The noodle makers on this list are specially designed with blades that cut veggies into long thin strands that you can use anywhere you would pasta. Because the veggie noodles come out thin and long, they don't really taste like the given vegetable anymore. This is especially true with zucchini pasta because it tends to absorb whatever sauce you put on it. This could be a simple marinara or healthy vegan alfredo. You can even go Asian with it and make a peanut sauce like we did here. You can even go 50/50 mixing half vegetable noodles and half regular pasta to up the nutritional content. This picture below shows just how nicely shaped you can get your final product if you get the right tool for the job. We want to make a quick point that this list is not all inclusive. It should also be known that not every veggie pasta maker on this list will be able to do every one of these vegetables. Much of it comes down to the leverage that the machine gives you and how the vegetables will fit into the machine. For the optimal balance of versatility and power, we recommend getting one of the suction mounted hand crank slicers. They will have the easiest time with all of these veggies as well as many fruits. Additionally, Inspiralized made this fancy page which helps you figure out exactly what you can do with their vegetable pasta cutters. We're huge fans of their veggie noodle makers and have thus featured them at the top of our list. Although cucumbers possess many of the same characteristics as zucchini, the inner flesh can be a bit softer and more watery. Anyone who has ever cut into a cucumber knows that their softness on the inside can vary. This means that when you make vegetable noodles they might start to fall apart a bit. If its not a zucchini or a carrot, then having a manual crank spiralizer is going to be ideal. Zucchinis and carrots are the only two vegetables that really go well in the hand-held veggie pasta makers. Most of the time you'll be fine doing cucumber noodles. Just feel them before you buy to make sure they aren't ultra soft otherwise the veggie spirals might fall apart. When you think of veggie pasta noodles, zucchini is probably the first thing that comes to mind. These are the perfect shape to be cut into vegetable spirals and are easily handled by any model on this list. Their flesh is generally the perfect texture and their shape is deal. There is a chance that zucchini pasta could get too mushy in the event that the vegetable is damaged or over-aged. You wouldn't want to eat these anyway. If you're lucky enough to have raw beets available in your grocery store, you're in for a treat. They are an awesome veggie to make vegetable noodles out of! So long as you get off the skin and cut both ends evenly, you should have no trouble spiralizing beets into noodles. You can eat the vegetable pasta raw or serve them roasted or boiled for softer noodles. Another video from Inspiralized below shows just how easy it is to make beet vegetable pasta. Carrots are going to be one of the easiest veggies to make vegetable noodles out of. They just so happen to be the ideal texture (not too hard and not too soft) with an oblong shape. The only time you might struggle is if the carrot is too thin. There simply won't be enough flesh for the blades to catch and turn them into vegetable noodles. That said, don't try throwing baby carrots into any of these veggie pasta makers. Look for the bigger more industrial-looking carrots in your produce section to make the task of making veggie noodles easy. They're usually sold individually and not by the bag. Believe it or not, you can actually make spiral cuts out of bell peppers. Now while we wouldn't quite consider them to be veggie noodles, they're still a great texture to eat. Combine them with zucchini noodles for a colorful vegetable pasta dish! Please note: this isn't really going to be possible with all of the models. If you want to do bell peppers then for a hand-crank unit is going to be ideal because it is most versatile. We do our bell pepper with the Inspiralizer pasta maker. The final featured vegetable is one of our favorites: sweet potatoes. As the starchiest vegetable of the bunch, we think that it makes the best textured pasta noodle. Since it's also pretty sweet, it makes the perfect base for any sort of savory dish, especially something with a bit of spice to it. For the final video, we have a demonstration of Inspiralizer pasta maker making sweet potato vegetable noodles! As we mentioned, there are different types out there. While the crank-styles are going to be ideal for sweet potato noodles, if you're just going to do zucchini vegetable noodles, you may want to consider some of the others. For the sake of making your final choice easier, we've narrowed down these vegetable noodle makers into three different categories: Handheld, Manual Standing Crank, and Electric. Handheld spiral slicers are great because of their convenience. They fit easily into most kitchen drawers and you can even travel with them. They're ideal if you're cooking for one or two people and tend to be the least expensive to boot. However, they don't have the same speed and efficiency as the other two categories. If you're going to be doing family meals on a regular basis or holiday cooking, you don't want to go with a handheld spiralizer. It will take too long to get the job done and you'll likely be tired at the end! 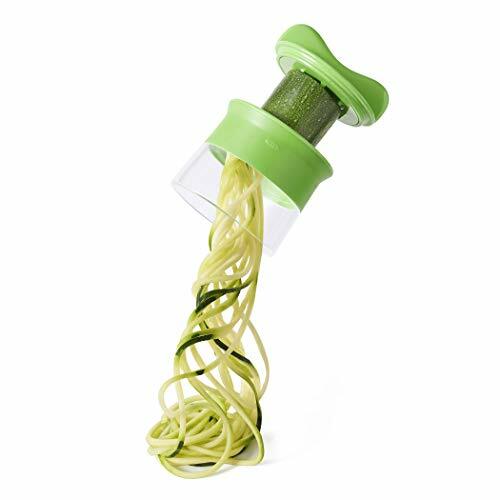 A spiral veggie noodle cutter with a standing crank requires some manual effort, but gives you a lot more leverage than handheld models. The good ones have stronghold suction which allows you to mount the unit right to the counter, attach the veggies, and crank! Before you know it, you'll end up with a huge pile of zucchini noodles. This mounting feature is critical as it prevents the unit from shifting around while you're spiralizing. Some of these models will also come with other types of blades. By switching out the spiral slicing blade for the julienne one, you'll be able to get all different types of shapes and sizes. Units like the Inspiralizer have different blades built into the machine itself which you can change with the turn of a small knob. Using some julienned carrots and cucumbers, you can quickly prep a cold veggie lo mein salad for lunch! 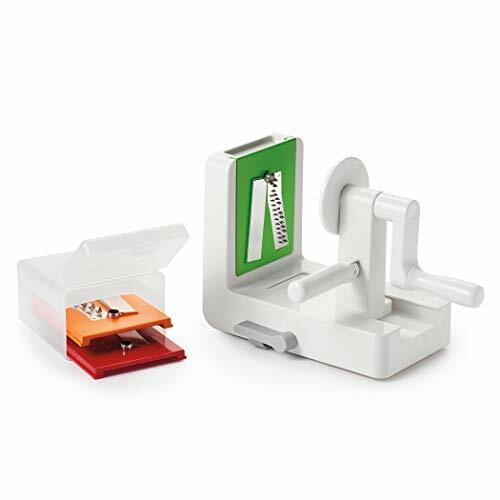 ​Electric models gives you the ability to create spiral slices with very little manual labor. You set it up by mounting the veggie to the unit and letting the motor pull things to the blades. This would be the case for the Kitchenaid Spiralizer Attachment. Units like the Veggie bullet function by feeding the vegetable through the top onto the spinning stainless steel blades. There are also food processors which double function as spiral vegetable cutters. As you can imagine, there's a lot more you can do with these, too. Much like the manual standing crank units, they're also likely to come with several different stainless steel blades. It's quick and easy to make various different cuts without much physical effort. If you think you're going to spiralizing a lot and have the counter-space, you may want to consider an electric model. No matter what sort of lifestyle you follow, getting more fruits and vegetables into your diet has a huge array of health benefits. Having a spiral slicer gives you an excellent reason to eat more of them. The final veggie noodles are easy to eat because of their pleasant texture and similarity to a real pasta dish. When prepared the right way, eating vegetable doesn't seem like a chore. Additionally, a spiral vegetable slicer can also take a lot of the work out of preparing vegetables and fruit into noodles and pasta – saving you time and energy. Should you use a knife to make similar style vegetable noodle, things aren't likely go to as quickly. Everyone knows that time is money when it comes to making dinner. If making something takes too long, then odds are you aren't going to have the motivation to do it regularly. This means that you're more likely to spend money on take out or other costly convenience foods that aren't as healthy as vegetable noodles! The video above is a great demonstration for what you can do with one. In this instance, Rawvana creates her own version of Pad Thai by cutting a raddish into vegetable noodles! While it wouldn't quite be a zoodle (zucchini vegetable noodle) in this case, perhaps we can call it a "roodle" (radish vegetable noodle)? PS: We don't recommend going on a raw food or raw vegetable diet at all, so enjoy vegan pasta treats like this once in a while. The best way to be vegan in the long term is to eat a variety of whole plant foods, cooked and uncooked. Which of These Vegetable Noodle Makers is Best for me? How often am I going to be making vegetable noodles? How much veggie pasta will I need to make at one time? If you're going to be cooking for more than one person, then you'll probably want to rule out any of the hand-held veggie noodle gadgets options that don't have a crank. These are designed for smaller batches of vegetable pasta and you're going to wear yourself out trying to cook for a lot of people. That said, most people would probably be better off with one of the mid-tier models like the Inspiralized or Paderno World Cuisine vegetable cutter. We get into the more nuanced differences below, but they basically do the same thing at the end of the day. Finally, if you have a Kitchenaid already, then i think that their spiral cutter is probably the best option. It's extremely well-crafted and powered by the strong Kitchenaid motor so you can't go wrong. If you already can't tell by the fact that we featured it so many times above. We love the Inspiralizer brand. The company has put a lot of focus into making pasta noodles out of veggies. So much so that all of their blades are dedicated to the task. Cutting thick and wide noodle ribbons. Making linguini shaped pasta out of your veggies. Doing a wider fettuccine style vegetable noodle. The traditional thin veggie noodles or what they refer to as spaghetti. The best part is you don't actually have to change blades. to select how you're going to spiral your veggies. The "noodle twister" button on the machine lets you do it with a little twist. 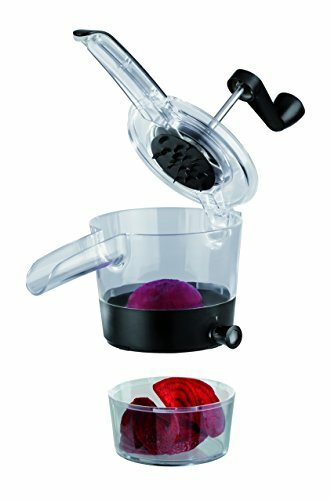 Like any good counter-top veggie pasta maker, it comes with a suction base which prevents it from shifting around you're cranking. This is essential for hard veggies such as sweet potato and celeriac. Another great design element is the size of the coring blade. It's designed to be small which makes it far easier to do thinner veggies. It also reduces the amount of waste product as you'll end up with a smaller core. If you check out the chart that we linked earlier, the limit is around 1.5" in diameter. This model also comes with a one year warranty for complete piece of mind that you're making a good decision. This machine has all the bells and whistles you could need to make any types of spirals, ribbons, or curly cuts that you can imagine. BPA-free, it easily creates beautiful spirals in seconds from either fruit or vegetables. It also doesn’t use electricity, saving you energy costs while not posing as any sort of electrical hazard – and it’s got dishwasher-safe parts, though it’s just as easy to clean it by hand. 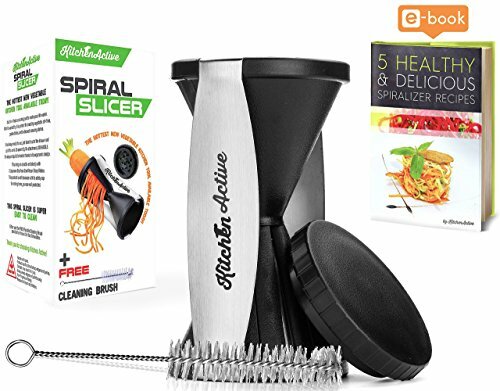 This spiralizer has a lot of social proof backing it and they boast being recognized by big names such as Food and Wine and Oprah Magazine. The Paderno is impact-resistant and built for long years of use, making it one of the best values on the market. Its three-blade system can be adapted for noodles of various sizes, from angel hair-thin to curly fries-thick. Each blade has a specific function and a different name. This includes the shredder blade, chipper blade, and straight blade. Respectively, these blades create thin strands, thick strands, and ribbon-style strands. For extra sturdiness, the unit comes standard with suction cup feet so that it doesn’t shift around on your counter. Given all these features, it should still be affordable for the average household, especially when you consider the long-term health benefits that come with consuming more vegetables. This three-bladed spiralizer produces solid and lengthy noodles that hold their shape well. It also has powerful suction on the bottom, so it won’t slide around or be pushed out of place while you’re using it. The OXO produces three different sizes of noodles – spaghetti, fettuccini, and ribbon noodles. You switch the blades by sliding them out and they all come with their own separate storage container. This high end spiralizer features heavy-duty design and easy usability, making it well worth the investment. You can’t really go wrong with a quality brand like OXO. It comes both essential features of a top quality spiralizer: stronghold suction and a coring mechanism. 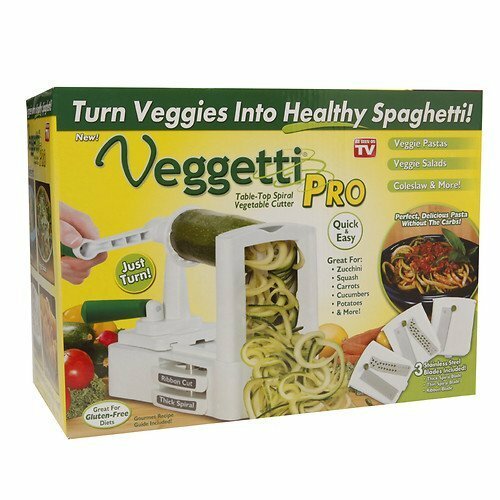 Also known as the “As Seen on TV Brand” of spiral slicers, the Veggetti has become quite popular both online and in retail stores. The Veggetti is compact enough to fit inside a cupboard or a drawer, is dishwasher-safe, and features a suction nonslip base. It also allows you to spiralize three different styles and sizes of noodles (ribbon, thin, and thick), making it one of the more versatile spiralizers on the market. It features a three-blade spiral slicer that works well with tougher vegetables such as potatoes. As in interesting engineering function, it also has a “drawer” on the side of the unit by which a user can store the blades for the different styles that they want to make. Because everything fits neatly and compactly, you’re unlikely to lose any blades. This electric spiralizer is a good pick if you don't want to deal with any cranks. With the chute at the top, all you need to do is feed a vegetable it, and viola! The final cut pasta shapes will present themselves right into the 6-cup bowl. Being that the bowl catches the final product, you're going to create less of a mess while spiralizing. However, if you're prepping for a lot of people, you'll have to be mindful of it filling up. The diameter of the chute is 2.5" which should be able to handle any kind of zucchini. However, things like butternut squash or cabbage are going to be more suited for the crank units. All of the removable parts can safely be cleaned in the dishwasher. It's well worth considering if you plan on working with a lot of oblong shaped veggies. As you might expect from the brand name, the Kitchenaid spiralizer attachment is pretty awesome. It only comes with one problem, you need a Kitchenaid mixer! It mounts right into the top portion of your Kitchenaid and runs off the same motor that runs the typical mixing function. ​First, you need to cut the ends off of your vegetables or fruits and make them as square as possible. Second, you mount the vegetable onto the fruit and vegetable skewer of the attachment. Next, line up the corer on the other end of the attachment to hold things in place. Turn your Kitchenaid on, starting with speed 1, and watch as spirals fall into the bowl! You can handle a wide range of sizes with the Kitchenaid. It's built to handle fruits and veggies that are 1.5" to 3.75"in diameter and less than 5.5" in length. Don't worry, you can always cut something down a bit if its out of the range. 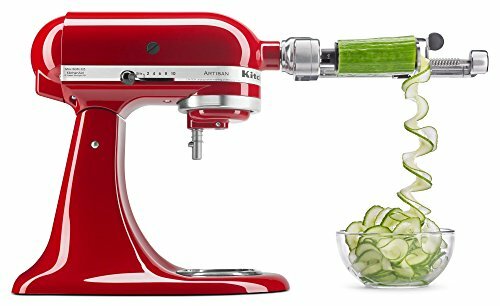 If you have a Kitchenaid and are looking for a vegetable noodle maker, this is the unit we'd recommend. We'd also suggest this if you were thinking about getting a Kitchenaid mixer and hadn't fully made the jump. It also comes with a 1-year warranty and double functions as an apple peeler, corer, and slicer! 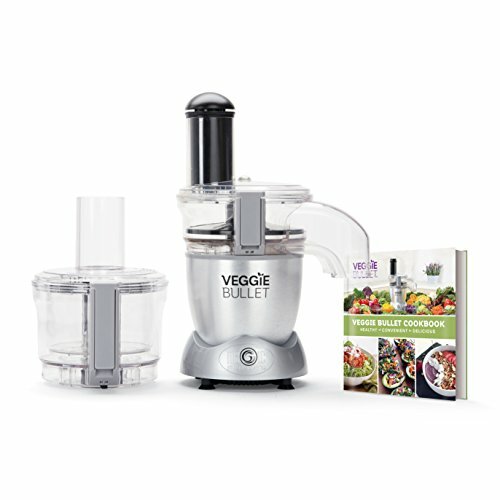 The Veggie Bullet isn't exactly a dedicated veggie noodle maker, but rather a hybrid food processor with a spiralize function. It has three settings: spiralizer, shred, and slice. The spiralize function is ideal for a regular sized zucchini, but isn't going to be the best choice for other vegetables due to the chute and blade size. Not to say that it won't spiralize other things, but it really just depends on the individual size and shape. It will definitely cut it, but may be more of a sickle than the noodles that the crank units are best at. However, given that the Veggie Bullet can do some other functions, we thought it was worth considering. We certainly don't mind if our spirals aren't perfect, shredded and sliced veggies are also awesome! The blades and ​motor should get through fruits and veggies quickly, but just not with the most accuracy. That being said, if you're not too particular about the final shapes, but just want to get the job done, this may be a unit to consider. This smaller model of the Good Grips spiralizer requires a little more effort to use, but takes up less space than its big counterpart. It can still produce solid noodles that don’t fragment or break apart, just not at a very high rate. Small enough to fit into a kitchen drawer, this single-blade spiralizer is an excellent option for those who don’t use their spiralizer on a daily basis. Its small size makes it yet another excellent option for travel. There are also versions available that include more blades, but at that point, why not just go for a standing crank unit? The OXO Handheld comes apart easily for cleaning, and is dishwasher-safe. It also features a non-slip grip for added safety when spiralizing. This is one of the types of hand-held veggie pasta maker options. Although not very versatile, this unit might be a good option if you have very limited storage space or just want the convenience of whipping out one type of spiralizer with no setup required. 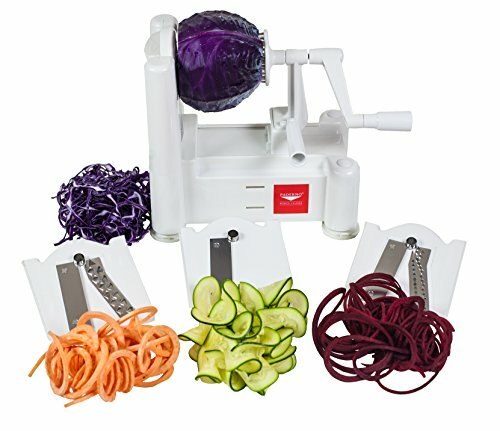 As of the least low-end spiralizers on the market, this compact slicer is well-suited to lengthy vegetables like thick carrots and squash/zucchini. Great for road trips, it’s quick and easy to use – and easy on the wallet. There are also many units on the market just like it so if you shop around you may be able to find something very similar and save a few bucks. It comes with a cap meant to insert the remainder of the vegetable when the user gets close to the edge. In theory this is a nice feature, but in our experience, it doesn’t actually function that well. Although it comes with a cleaning brush, it can still be kind of difficult to get entirely clean, but this isn’t unusual for these types of products. They have a lot of small spaces and cleaning can be detail oriented. We always end up spraying with high pressure water as it does a better job than the brush. Because it’s only adapted to certain vegetables and fruits, the Kitchen Active isn’t the most versatile option when compared with its fellows. However, if you only occasionally spiralize and want a lower end option, the Kitchen Active is a great bet. What’s more, this tidy black and clear spiralizer allows you to fully customize the size of your noodles with four different size options. It can also be hand-cleaned or put in your dishwasher. The upside to the Spiralfix is its ability to spiralize things right on top of a salad or into a bowl. Many of the hand-crank spiralizers can be a bit messy because it is hard to fit something under the entire unit. This means that softer fruits or veggies can leave behind water on your counter. This can be avoided with the Spiralfix. However, without the ability to mount the the counter top, you’re likely to find this unit harder to use than the suction type hand cranks. Using strictly your hands, you’re likely going to have less leverage and thus may experience more slippage. This may vary on a case by case (and veggie by veggie) basis. Vegetable noodle maker are fantastic appliances to have at home to make your day to day cooking more interesting and healthier. These veggie pasta makers can help you adapt your favorite recipes to include more whole plant foods. This means more health promoting micronutrients, and phytochemicals without the excess calories. Whether you use you're making veggie noodles as the base of your meal, creating healthy snacks on the go, or accentuating a dish you've already made, it's a good investment for making quick and beautiful dishes – at home or on the road.